One assumes that dictators are cruel and inhuman without a good side to them, but Colonel Gaddafi has some good personality traits. forceful personality. His developed mounts, deep well-cut lines, strong, curved and high-set Jupiter (index finger) and strong thumb show immense physical and mental energy and a clear purpose in life. He has a broad palm, and slightly short fingers. As odd as it may sound, his purpose is not primarily a selfish one, seen by the setting of his thumb. Sure, he craves for power, and it is his driving force, but it's important to remember that he has a humanitarian side to him. He has a mission, a purpose in his leadership. His Headline and Saturn line show his persistence, perseverance and concentrative ability. His thumb shows his reasoning ability and diplomacy. His head is always in the lead, despite a deep Heartline. This, in addition to his pragmatism, enable him to make hard, even ruthless decisions. 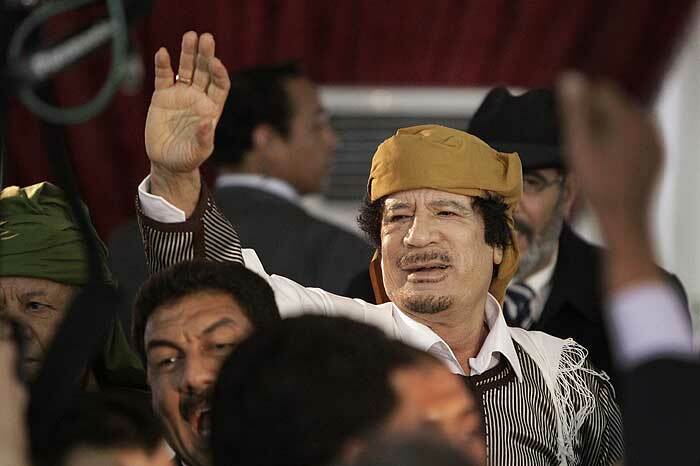 Gaddafi’s Mount of Mercury is well developed, and so is the little finger. This shows mental and physical agility, confirmed by the strength of all his lines and Mount of Venus. He is also fairly intuitive, and very clever indeed when it comes to handling people. His shrewdness, persuasiveness and manipulative ability is the strongest aspect of his character. He can put on an act easily, and fool people. However, despite these qualities and a well-shaped Headline, Gaddafi cannot be considered intelligent in the true sense of the word. His hand is too fleshy and his fingers too thick to give him clarity of thinking. Also, the shape of his fingers betrays a love of physical comforts and an overpowering desire to lord it, be in the limelight, and control others. And all of Gaddaffi’s Mars Mounts are developed, giving him excessive aggressiveness and resistance as well. Perhaps this, and the development of the lower part of his hand gives a clue to the streak of violence in his character. He is not discouraged easily, he is a fighter. Mental strength by itself is a good character trait, but for someone like Gaddafi who likes power, it is usually counter-productive. 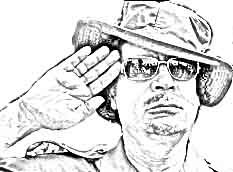 If Gaddafi’s schemes fall flat (he is a perennial schemer and planner) he is the kind who will dig his heels in. The stubbornness is enhanced and confirmed by his thumb, its shape and its phalanges. Arrogance and vanity are also shown on his hand. In a nutshell, Gaddafi is a smart man with some good ideas and compassion for others, but he is not a strategist and thinker. Besides, he is loath to take advice from others. Perhaps if he had been born and nurtured in a country with democratic traditions, his inherent despotic and aggressive nature could have softened and he would have made a decent leader. Hand Readings of other African leaders: Nelson Mandela's hand reading or Idi Amin's hand reveals his lack of reasoning powers or Kim Jong-il's hand reading or Jacob Zuma's hand analysis or the hand anaylis of Hitler. Or read about the Heads of State of different countries around the world. Interesting personality. He is not the type to give in. Is there any way you can predict the future by his lines? TN, The lines below his fingers which shows his later years are not very clear. Therefore it is not possible. Also in the photos one gets on the net, however clear they seem to be, the minor lines are not visible. The minor lines are an important indication and cannot be ignored. There were some good photos of gaddafi's hands but not so sharp as to reveal his minor or faint lines. One cannot assume he doesn't have them, although that is tempting. I think such people get addicted to power, and cannot let it go even if the power gets overwhelming and becomes a source of threat to them... What about his reasoning powers? Does the hands say anything about that? DI, he certainly has reasoning powers and some amount of brain as well. Unfortunately he also wants his way and when his emotions are aroused and if he feels his own power is at stake then his reasoning powers are overridden. That is the problem with most unbalanced personalities. They have some good things about them, but the negative qualities are too strong for the good forces to operate at all times. click on the above url. in this pic u can se a line coming out of the life line connecting the heart line. i assume this is called an effort line. Mr. Curious, your comment had automatically gone into spam, I think because of the long url. Anyway, what you are referring to is another fate line starting from the life line. I am not sure what it is that you are asking here. That line is to be read as another fate line starting from the life line. But look, why don't you write your real name? 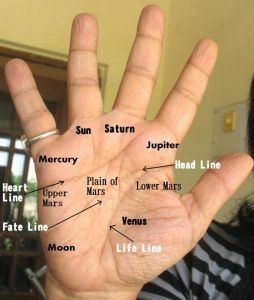 Are you studying palmistry? If you are, what is the point of writing under an anonymous name? no i am not studying palmistry just getting a hang of the basics. which lines or marks show his bad fate in his later life? I would have to study his hand properly to answer your question. Usually when I do these readings, I rely on a few photos off the net and they are not that clear.